Preventing tampering with sensitive data is the challenge facing security experts worldwide. Because of that, cybersecurity is an area of rapid employment growth. Central Washington University students are getting rare hands-on training with the encrypted-database technology “blockchain.” It’s happening through a new university partnership with the global technology firm the Compliant Cloud, and its proprietary platform QuodCrypt. 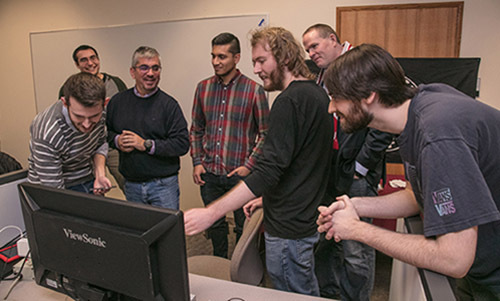 Bob Rapp, the company’s co-founder and chief product officer, has established an internship program involving five senior CWU computer science students. They are now developing a new public safety video application, using QuodCrypt, specifically for the iPhone. QuodCrypt is a cloud-based solution allowing for confirmation that a video is not altered or—at a minimum—indicates when it was revised. The blockchain security protocol it uses first came to general prominence as a way to secure cryptocurrency transactions, like Bitcoin. Rapp, who moved to Ellensburg several years ago, approached CWU President James L. Gaudino and Vice President of Operations Andreas Bohman about the possibility of collaborating with the university on cybersecurity and blockchain. Rapp, who previously was a senior leader for cloud-based businesses at Microsoft, VMware and IBM, agreed. Senior Parker Jones, from Seattle, is another one of the Central students involved in the project. Rapp is also working with other universities around the world, such as Oxford, Cambridge, and Beijing Normal, which he described as the “Stanford of China” along with potential clients for the CWU app in Amsterdam, Berlin, Los Angeles, Tokyo, and Sydney. Ultimately, Central students may get the chance to accompany Rapp or another team member on business consulting trips, which are not typical for computer science students to do. Photo: Bob Rapp (top right) with his student interns in the CWU Skunkworks.